Being able to successfully and safely climb stairs is an important goal for many patients as they progress through rehab. Our physical therapy stairs lets clinicians help patients achieve this goal in a safe, secure environment. 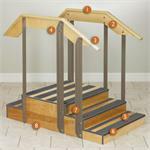 Our most popular rehab stairs have a small footprint. Available in both one sided and two sided options, our therapy stairs are perfect for clinics where space is at a premium. One sided rehab stairs save valuable floor space, while double sided therapy stairs allow patients to perform stair training exercises without having to turn around. 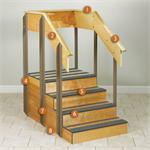 Find physical therapy stairs that are safe, durable, and built to last at e-current.com today.